It starts here. 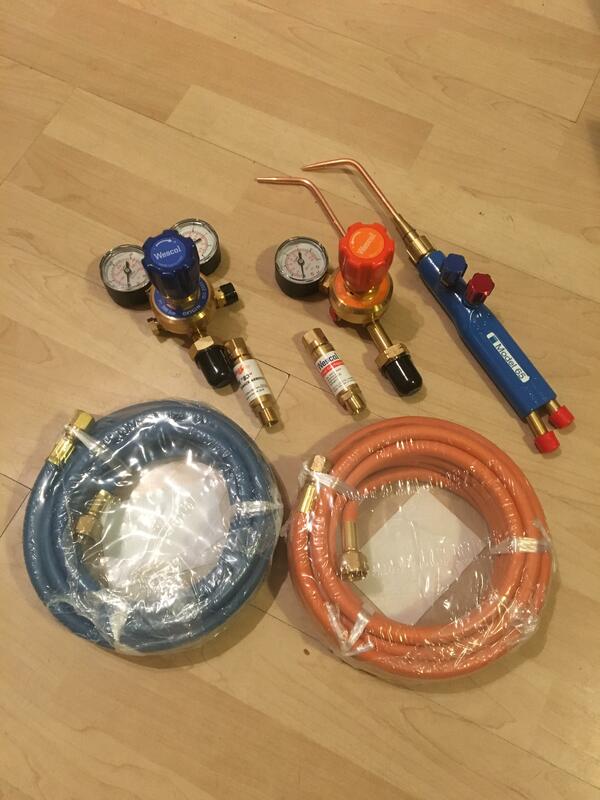 Picked up this oxy propane kit which got delivered today. I have a few tooling bits and bobs around but no access to workshop equipment so this will be very much a home hobby for now. The aim is to learn brazing and be able to build myself and friends frames as well as make some modifications in terms of adding bosses etc to existing frames. I considered a framebuilding course which obviously would teach me all of the techniques I would need but for the cost of one of those, whilst it teaches you a great deal from an experienced builder, I thought I would just get some equipment together and be able to do quite a lot of practise before I’d spent the same amount so here we are. I’ve done a fair bit of reading and watching so I have an idea of how to start but this will be very much self teaching, trial and error. I think I’m going to start with a lugged frame for ease. That is once I’ve had enough practise on scraps. Plain old rim brake, traditional geo, nothing fancy. I won’t attempt forks in the first instance. I vote you build a tandem recumbent. Invest in some leak tester. No PTFE tape on any fittings. Brass on brass. Read UK gas safety regulations things. Maybe do an actual course to stay safe.... Maybe not. I might have some documents for you. Make sure you don't breathe the vapours. Please. Duly noted. I’ve already looked up the welding and brazing night course at my local college. Who are you mystery frame chopper? I think I’m going to start with a lugged frame for ease. I'm doing bb lug, fillet everything else. Think it's the way Bicycle Academy teach. I imagine my first few will be done this way. What gas you going for? As in, rent free, Hobbyweld etc? I just did my first swap on the hobbyweld oxygen today. Super, best way to do it. Get yourself a massive garden but (lol) to soak everything off. Super interesting project - subscribed. It's something I'd always dreamt of starting before I moved to London. Edit: whats the law regarding Oxygen & Propane bottles here in the UK? will you buy the bottles and have them refilled every so often, do you need a license of some sort? in a millennial way, would you have a vlog? Because reading text is so 2002. Outdoors I’d have thought, we have sliding doors going out to the garden so maybe indoors with the doors open. Moving house in August so if it’s something I want to continue by that point, we may look for somewhere with a suitable space or I’ll look for a shared workshop space. I’m not too sure about keeping gas but I think it’s fine. The reason I went for propane over acetylene is that storing should be a bit less risky as I’ve read mixed opinions on the spontaneous combustion properties of acetylene. Because I won’t be going through a lot of gas, I think it makes sense for me to go for rent free bottles where you pay a deposit for the bottle and then a cost per refill.